DUE DATE: February 17th, 2002 at 9:00 pm. 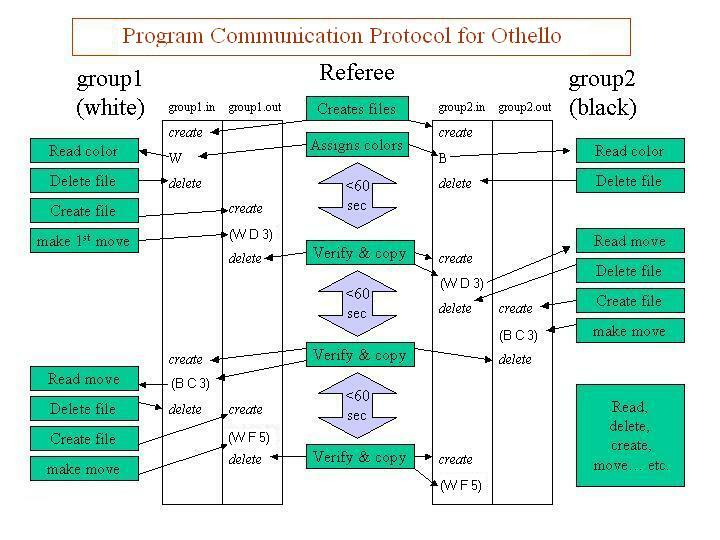 This project consists of designing and implementing a program that plays Othello. To some this game is also known as Reversi. It will exemplify the minimax algorithm and alpha-beta pruning. Usage of any machine learning technique (e.g. Decision Trees) along with the MinMax algorithm will earn extra credit and perhaps improve performance in the tournament. Othello is a two player game (one of them being your computer program). The classical game board is an 8 by 8 grid. At the start of the game there are four pieces in the center of the grid. White in the top-left and bottom-right. Black in the top-right and bottom-left. (See Figure 1 for initial configuration) Players take turns placing pieces on the board until the board is full. The object is to catch opponent's pieces between two of your pieces to flip them to your color. At the end of the game, whoever has the most pieces on the board wins. One of the players uses white pieces and the other one uses black pieces. We will use an 8x8 board. We will label the the board as in Figures 1-3: columns A through H (left to right), and the rows 1 through 8 (bottom to top). The player with the white piece moves first. There are two types of legal moves. First are those which trap at least one opponent piece between pre-existing pieces of your color on the board and the currently placed piece. This trapping could be horizontal, vertical, or diagonal. The other legal move is a PASS. This move can only be taken when there are no trapping legal moves available for the player to take. See links at the bottom for game downloads and online play. NOTE: Executing a PASS when there are other moves is considered an illegal move. In the tournament, this would automatically cause a loss. For example, a possible first move of the game is (W D 3), meaning that a white piece is placed in column D (the fourth from the left), and it occupies row 3 (the third from the bottom). This would result in the black piece at (D,4) being converted to a white piece (see Figure 2). It would then be player 2's turn. A possible move for Black would be (B C 3), placing a black piece in column C, row 3. This results in the white piece at (D,4) being converted to a black piece (see Figure 3). 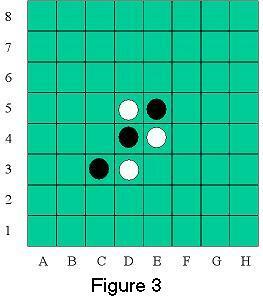 It is selected at random which player will use the white pieces and which player will use the black pieces. In what follows, the player that gets to use the white pieces is called player 1 and the player that gets to use the black pieces is called player 2. Player 1 gets to play first. color is W if it is player 1's turn and B if it is player 2's turn. There is no piece at column, row. There is a sequence of opponent pieces followed by your piece starting from column, row in at least one of eight directions. If not, the turn is lost and the other player goes again. After the move, the place at column and row on the board will be occupied by a color piece. For each of eight directions (up, up-right, right, right-down, down, down-left, left, left-up) any sequence of opponent pieces followed by your piece starting at column, row is converted to a color piece. It will be the other player's turn. There is no open (col,row) with a necessary sequence of opponent pieces followed by your piece starting there. The board is full. The player with the most pieces wins the game, and the other loses the game. If the number of pieces is equal, then the game is a draw. neither player can make a legal move, the player with the most pieces wins. a player makes an illegal move - the other player wins. a player fails to move within the time limit - the other player wins. Your group must implement a program that plays Othello. Each group needs to pick a one-word name for its program. Your program must use the minimax algorithm with alpha-beta pruning. Use a utility function (i.e. static evaluation) of your choice. Use a heuristic/evalution function of your choice (remember that the evaluation function and the utility function must coincide on final board configurations). You are encouraged to use machine learning techniques here to obtain a good heuristic function. Use a heuristic of your choice to avoid expanding the whole minimax tree. You can choose from those covered in class (progressive deepening, heuristic continuation (singular-extension heuristic), and tapered search) or another one of your preference. We highly recommend using the progressive deepening heuristic. The better your evaluation function and your heuristic, the better your program will play, and the better your grade in the project. Your program must produce only valid moves. Your program must detect if the game has come to an end, and if so, it must print a message stating who won. Your program must follow the specification given above so that it can interface with other groups's programs. If you want, you may implement a graphical interface for your program, that displays the configuration of the board during the game. Such an interface is NOT required. Use of a machine learning technique in addition to minimax with alpha-beta prunning is completely optional but very much encouraged. There are many communication methods that are far more elegant and efficient than this one, but the intent is that this method will result in the least elaborated code, and that it allows you to implement your program in your choice of languages. The debugging is also simple since you can control the contents of these files with the use of any text editor. Each group needs to pick a one-word name for its program. We'll refer to that name as groupname in what follows. Each group must submit the code of its program and an executable (or script) named groupname. A referee program, described below, will be told what two groups are going to play and the referee will execute the programs. At the beginning of the game, the file groupname.in will contain the letter W, if the corresponding program must play with the white pieces, and the letter B otherwise. The referee program will take care of creating this files and making this assignment. Each program must read the groupname.in file to determine which color it will be. After reading its color, each program must DELETE its own groupname.in file, so the referee program knows that each player knows its color. 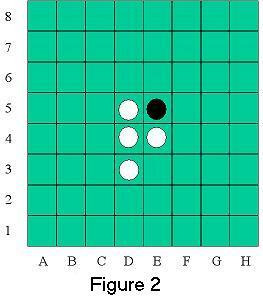 In what follows, the program that gets to use the white pieces is called group1 and the program that gets to use the black pieces is called group2. Group1 writes the first move, say (W D 3), to the file group1.out. 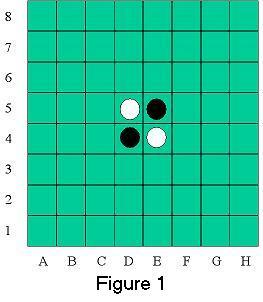 Then, the referee will copy this move into group2.in so the second program can read the move. After reading this move, group2 must DELETE the group2.in file, and before exceeding its time limit, write its move to group2.out, say (B C 3). The referee program will read this file and copy it into group1.in, and the whole process is repeated until the game is over. Note that a program will know that it is its turn by the presence of a groupname.in file. After reading that file, the program must delete it. Also, the program must CLOSE (not delete) groupname.out at the end of its turn and re-create it on its following turn. A referee program is provided. This referee program is in charge of deciding which program goes first, giving each program's turn to the other program, displaying the board configuration, detecting illegal moves, and enforcing time limits. Assigning which program goes first, as described above. Displaying the board configuration after each move. Giving turns to each of the playing programs. By creating the file groupname.in, the referee program is giving the turn to groupname. Detecting invalid moves. If the referee program finds an invalid move, it will stop the game, announcing that the offending program has lost. Ending the game when all positions on the board are occupied, announcing the winner. ALL groups who want to participate in the tournament must submit the tournament version of their code via turnin with project name 'tournament' (even if you already submitted working code). 'tournament' submissions will close Sunday at noon (12:00) exactly. Your program must not consume computing resources during your opponent's turn. In this spirit, when it is your opponent's turn, your program should simply wait for your opponent's move. Your program may check for the existence of the input file, at most, every 100 ms. To do this, your process must block. In C, this will probably mean some use of ualarm() and pause(). In Java, Thread.sleep() will do the trick. In C++, maybe there are some convenient functions in <pthread_alloc>. Whatever you do, you MAY NOT simply "burn time" by counting in some tight loop in between file checks. Your process must block. Both players will be executed on the same machine, and may not spawn processes on any other machine. Points: Your group can earn bonus points. These bonus points will be added to your project #3 score. If the bonus point scheme changes, it will only be in the positive direction. The tournament structure will be determined when we know how many groups will participate, but every group is guaranteed at least 3 games. The more games your program wins, the more games your program will play. Unless one of the finalist teams object, championship game will hopefully be held in class. Please email us (cs4341_ta@cs.wpi.edu) with any additions, deletions, or name changes of group members or groups from previous projects. describe which tests you ran to try out your program. Did you program play against human players? Did you program play against other programs? How did your program do during those games? a discussion of why the evaluation function and the heuristic are good choices. Finding a good static evaluation function and a good heuristic depends heavily on the experience you have with the game. I recommend you start playing the game and getting the flavor of what a good Othello strategy is. Also, research the strategies that other people have used for this and other games. Lots of information can be found in the references listed in your syllabus, the web, and magazine articles. Any auxillary files that your program requires, such as a script to run a language interpreter. Although you are welcome to look at code and systems available online to guide the design of your program, you MUST submit your own original code. of good offensive and defensive behavior. responsible for the same error checking that the referee performs. -see the referee and email sent out about timing in C.
is figuring out what information you need at each node in the tree. algorithm, I can throw around some ideas. that will make your code look clean and easy to debug. where your classmates could be your best resource. No graduate part required this time. Just do your best job in getting the best playing system you can.